Since, each organization has their own outlines and each lesson will need to be specified to the individual class members and there are already amazing outlines that can be used for guidance, I am only going to share some general ideas that can just be used as supplements. The great thing about this program is to allow the spirit to guide you to the needs of the youth in your class. Prepare before hand, Pray for guidance, Listen to the Promptings of the Spirit and invite the youth to do the same. Why was a restoration necessary? Invite the youth to think about something that is important to them, something that they love. Know have them picture that thing being taken away. Explain that while Christ was on the earth he established His church. 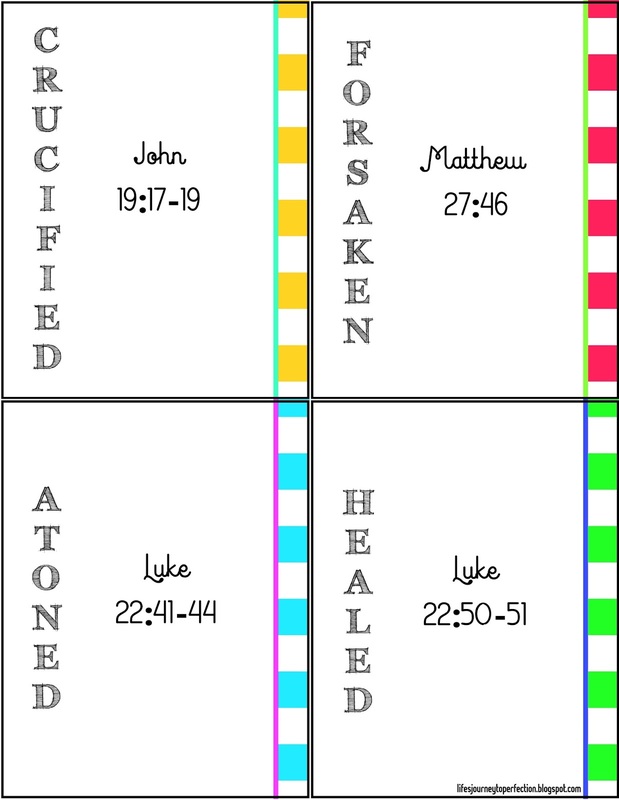 After His crucifixion and the deaths of His apostles the church along with the priesthood where taken from the earth. Invite a youth to read the following scripture: Amos 8:11-12. Discuss this scripture as a class. Write on the board, "Why was a restoration necessary?" Invite the youth to share why their thoughts on why they believe the restoration of the gospel was necessary. Play the video, "The Message of the Restoration" Discuss the video as a class. Draw on the board a winding path in the middle of the path erase a large section. 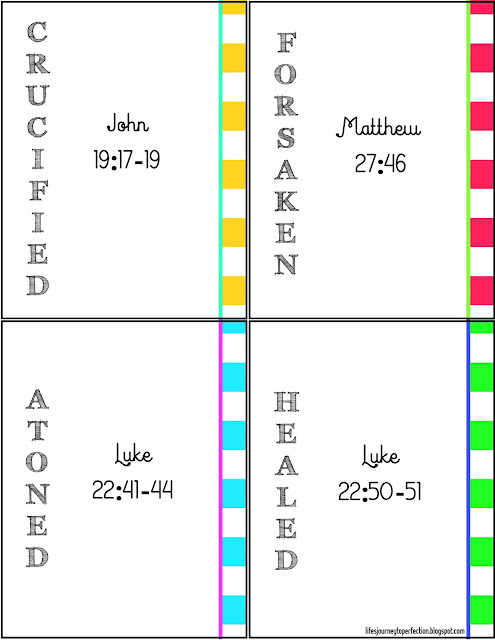 The first part of the path write, "When Christ was on the earth" . In the empty erased part write, "The Apostasy". Then when the path starts back up again write, "The Restoration of the Fullness of the Gospel" Discuss how essential the restoration of the fullness of the gospel is to God's plan and the salvation of mankind. Why do we need the Book of Mormon? Show the youth the picture: The Scriptures. Ask the youth the question, "Why do we need the Book of Mormon?" Invite a class member to read the following quote, "The Book of Mormon was written for our day. It testifies of Jesus Christ, contains the fulness of His gospel, and restores truths lost through the Apostasy. Joseph Smith taught that the Book of Mormon is “the keystone of our religion, and a man would get nearer to God by abiding by its precepts, than by any other book” (introduction to the Book of Mormon)." 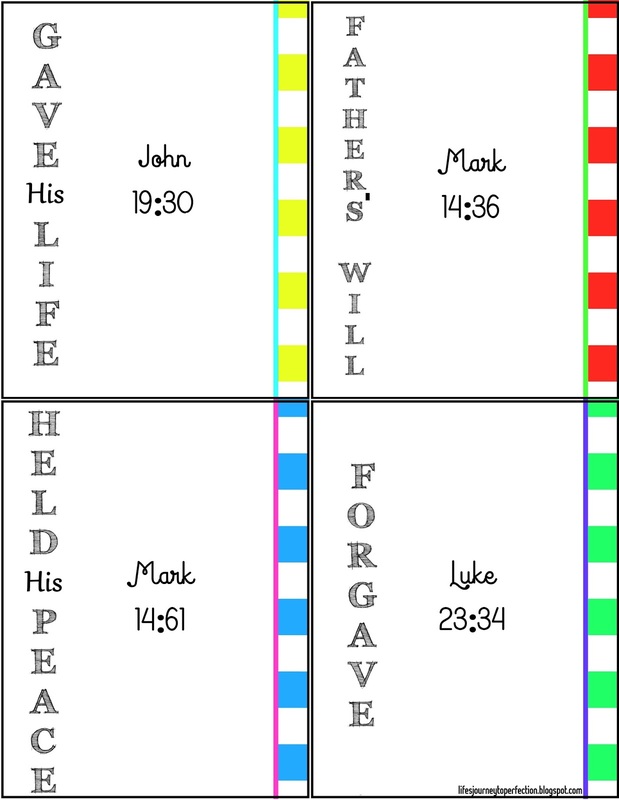 Invite each class member to think about a scripture that has had special meaning to them and invite them to share it with the class. Play video, “Study the Book of Mormon” and or "For Our Day" or "Book of Mormon Testimonies" or "Book of Mormon: Messages from Heaven"
How was the priesthood restored? Begin by reminding the class that after Jesus was crucified and his apostles were killed, the priesthood along with the church was taken from the earth. Write the question on the board, "How was the priesthood restored?" Invite the youth to take a minute to think about this question and then share their thoughts about it. Play the video, “Restoration of the Priesthood” Discuss as a group this video. Give each class member a piece of paper. Invite them to take notes as they watch and listen to Elder Holland's 2005 General Conference address, "Our Most Distinguishing Feature". What was Joseph Smith’s role in the Restoration? 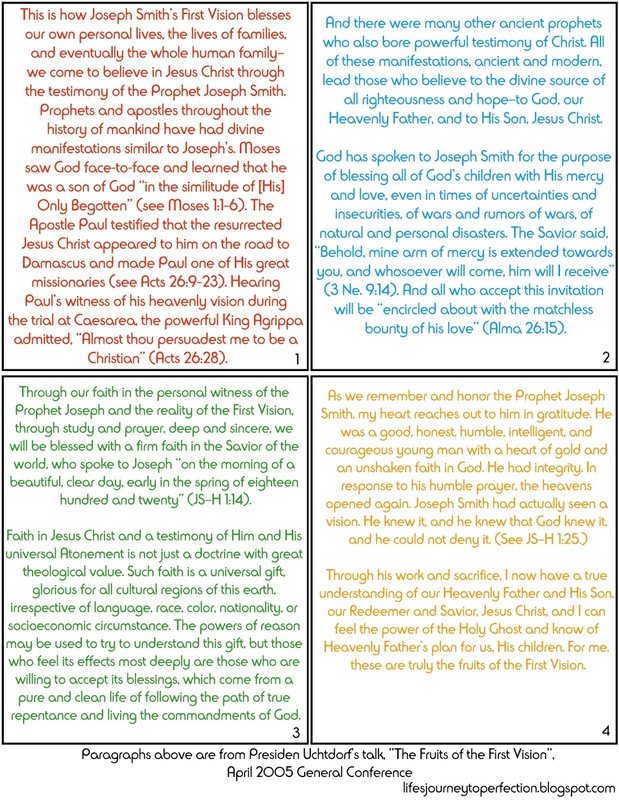 I liked this idea on lds.org, "Ask the young women to imagine that a friend of another faith asks, “Why is Joseph Smith so important in your Church?” Invite them to look for possible answers to this question in the video “Joseph Smith: Prophet of the Restoration” or in Elder Lawrence E. Corbridge’s talk “The Prophet Joseph Smith.”"
Why is the First Vision important? Write on the board, "Why is the First Vision important?" Ask the young women the following question, "What blessings have you received because of the First Vision?" Have a bean bag and toss it to one of the YW, have here say a blessing she has received because of the First Vision, then have her toss the bean bag to another, YW. Continue until all of the YW have shared an answer. Give the YW one of the cards from the printable below, from Pres. Uchtorf''s 2005 General Conference address. In order read through the paragraphs and discuss the blessings we have received because of the First Vision. How can I invite all to come unto Christ? Write the word Duty on the board. Invite a youth to read, D&C 20:59. Give each young man a sticky note and have them write on it a priesthood responsibility they have. Invite each young man to come and stick the note on the board. Invite discussion on priesthood duties. Explain one of their duties is to "Invite ALL to come unto Christ. Play the video, "Inviting all to come unto Christ: Sharing the Gospel" Brainstorm with the Young Men, ways they can invite all to come unto Christ. What does Joseph Smith’s example teach me about learning the gospel? Show the video, "Origin" Discuss with class how this video experience is likened to that of Joseph Smith. Invite a youth to read, "Joseph Smith sought spiritual knowledge while acting as the Lord’s instrument in restoring the gospel. He pondered the scriptures, asked inspired questions, and acted upon what he learned. As we follow the Prophet’s example, we can receive answers to our questions and inspiration to guide our own lives." 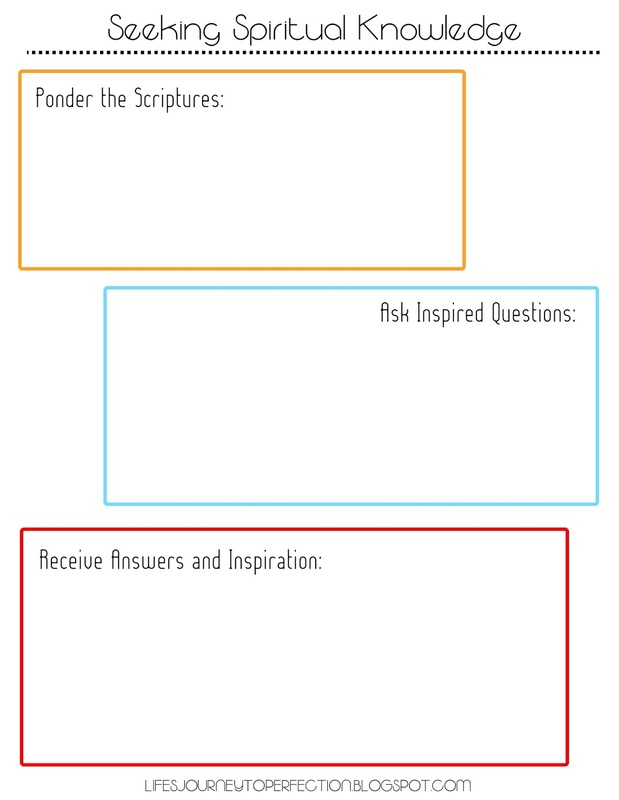 (Lesson header on lds.org) Give each class member the "Seeking Spiritual Knowledge printable" see below. Invite the youth to think about a question they have write it in the middle box. Invite them to write it down and then to each take a moment to try to seek knowledge through the scriptures. 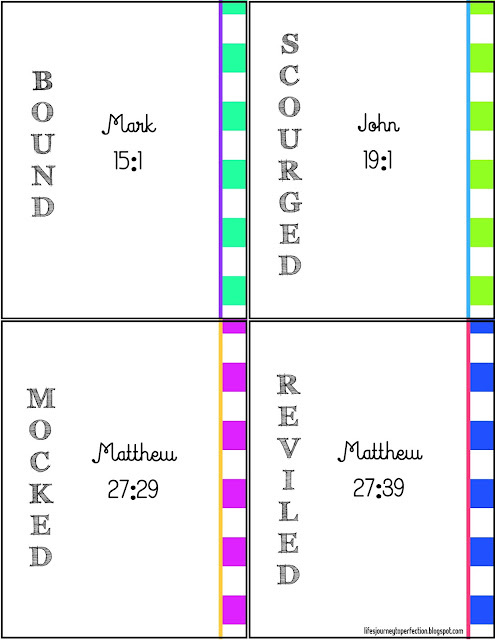 Invite them to write scripture references and thoughts in the top box. In the last box invite them to write any answers or inspiration they might receive. Invite them to share experiences with the class. How can I recognize the difference between truth and error? Play the video, "You will be Freed" Ask the question, "How can I recognize the difference between truth and error?" "How can we recognize these deceptions and not give into them?" Explain that we have our own personal lie detector, it is the Holy Ghost. He sends us peaceful and warm feelings when we are living and making the choices that are inline with our Heavenly Father's will. When we are faced with danger or in circumstances that are not inline with our Father's will we do not receive those peaceful feelings, but instead we receive feelings of discomfort and confusion. Give each class member a peace of paper and invite them to think about choices they are facing. 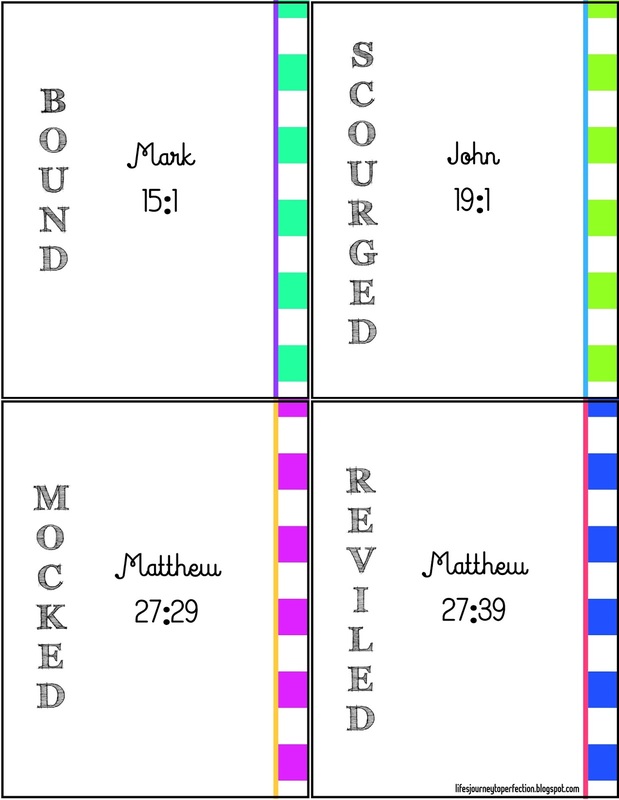 Read together as a class Moroni 7:12–19. Then invite the class to write on their papers how they can make decisions based on the scriptures. Why is it important to teach pure doctrine? Great ideas by following the link. 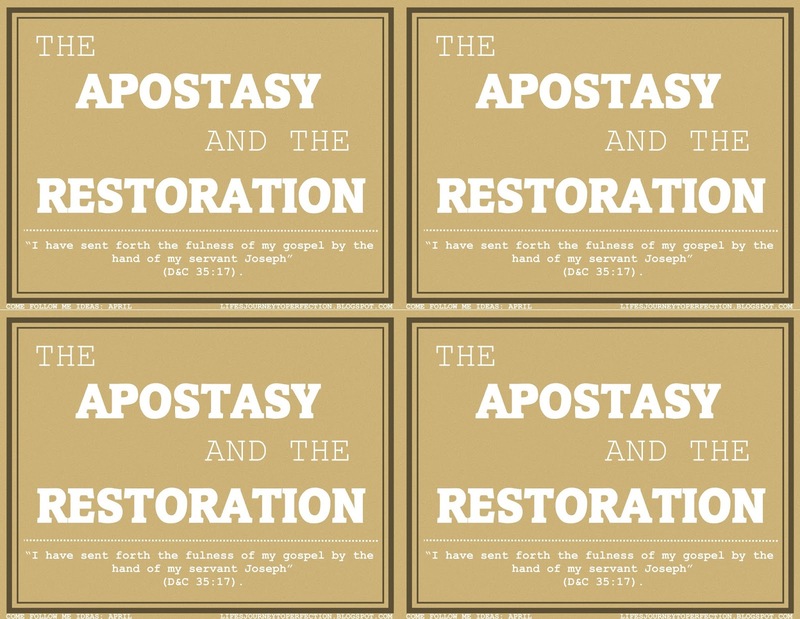 How can I liken the events of the Apostasy and the Restoration to my life? Invite a youth to read this quote, "We should “liken all scriptures unto us, that it might be for our profit and learning” (1 Nephi 19:23). 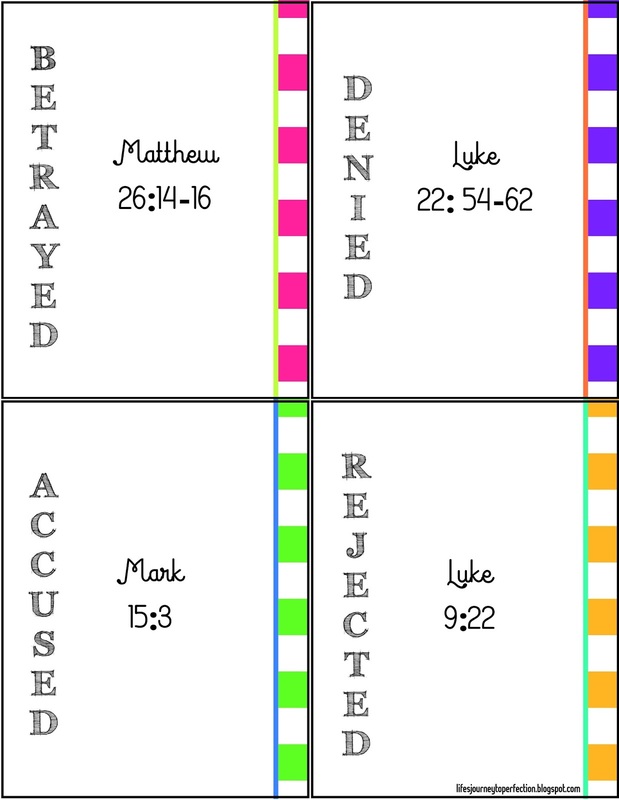 To liken the scriptures means to see how scriptural events and circumstances are like the events and circumstances in our lives. Even though the events of the Apostasy and the Restoration occurred long ago, we can find ways to learn from these events and relate them to us today." (from lds.org Come Follow Me May) Then choose one of the great suggestions from Come Follow Me. 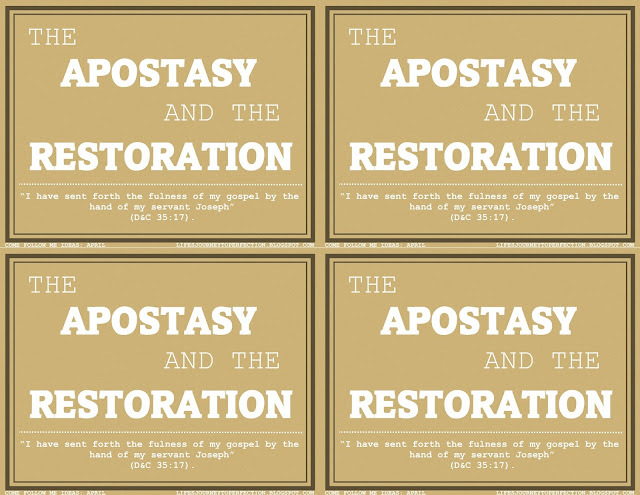 How can I explain the Apostasy and the Restoration to others? Pair class members up. Explain that one of the class members will pretend to be a non-member friend. The other one will be the one to answer and explain the Apostasy and Restoration. Invite them to use what they have learned in the lessons that had been taught throughout the month. 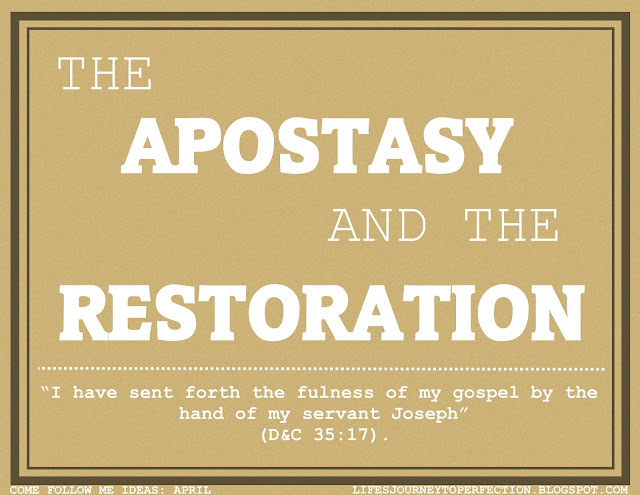 Write some scriptures on the board that could help in explaining the Apostasy and the Restoration. Invite them to roll play. When they are done, discuss as a class the experience. Printing tip: Click on the image and save to your computer. You will then be able to print the image from your computer. I'm not seeing the Seeking Spiritual Knowledge printable. Am I doing something wrong? Sorry!! Crazy it wasn't there. I have re-uploaded it and I placed an easy link on the header where you can print it. Thanks so much, sorry it wasn't there! Thank you so much! I've just been called to this position and my first Sunday is coming up. I'm freaking out!!!! You'll do great!! Just prepare as much as you can and invite the spirit to help you teach :) What I love about the Come Follow Me is the involvement of the youth in the lessons. My best lessons have been when the youth have shared their incites and experiences :) Best wishes! !